National Scoliosis Foundation – NSF is a patient-led nonprofit organization dedicated to helping children, parents, adults, and health-care providers to understand the complexities of spinal deformities such as scoliosis. Advocating for early detection of scoliosis and prevention of progressive spinal deformity. Informing the public, healthcare, and policy making community about the burdens of spinal deformities. Through written materials, verbal communications, referrals, physical meetings, and online services: You are not alone. NSF is a Patient-Led organization, dedicated to improve the lives of those living with scoliosis and other spinal deformities. The NSF Forum is a place for patients and caretakers to communicate with others and get personal answers. Our curated resources provide support to nurses, teachers, volunteers and other professionals. NSF also provides case management to patients in need of support. From industry newsletters to medical updates to youth fashion tips, the National Scoliosis Foundation curates a rich supply of helpful materials, links and mailing lists for all ages and walks of life. Join our diverse, online community of people affected by abnormal spinal curvatures. Our free-and-open public forum provides a venue for shared stories, complex conversations, and daily encouragement. The official store is now open! Browse our carefully selected catalog of books, videos, accessories and personal equipment. Every purchase supports the National Scoliosis Foundation. Your generous financial support empowers and advocates for those living with abnormal spinal curvatures. The National Scoliosis Foundation — a 501(c)(3) nonprofit — is dedicated to minimizing the effects of scoliosis through early detection and treatment, public awareness, patient education and support, and research. Together, with your help, we can continue to make a difference. 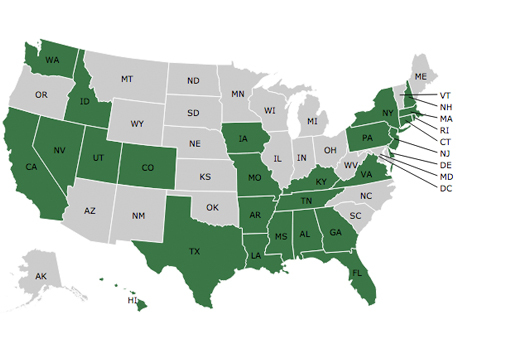 Here at the National Scoliosis Foundation, we are striving to bring you the most up-to-date information on the policies your state has in place for Scoliosis Screeing in schools. Our Goal is to achieve a 100% screening rate for early detections. The National Scoliosis Foundation (NSF) is a patient-led nonprofit organization dedicated since 1976 to helping children, parents, adults, and health-care providers to understand the complexities of spinal deformities such as scoliosis. Severe scoliosis impacts the quality of life, putting pressure on the heart, diminishing lung capacity, and limiting physical activity. Thankfully, through early detection and treatment advances, the worst effects of scoliosis may be prevented.We are involved in all aspects of scoliosis support, whether the issue is early detection through screening programs, treatment methods, pain management, or patient care. Our focus is on promoting public awareness, providing reliable information, fostering ongoing research in the field, and educating and nurturing the community of those affected by scoliosis. Our community of Parents, Patients, Experts, and other Concerned Individuals are invited to share and discuss information through our monitored forum. National Scoliosis Foundation published a note. The National Scoliosis Foundation (NSF) is a patient-led nonprofit organization dedicated since 1976 to helping children, parents, adults, and health-care providers to understand the complexities of spinal deformities such as scoliosis. We ask for your generosity in providing the financial support needed to continue our efforts to minimize the effects of abnormal spinal curvatures. Together, we can continue to truly make a difference in people’s lives, and perhaps change the course of scoliosis history. Thank you for your support! © 2016 National Scoliosis Foundation.